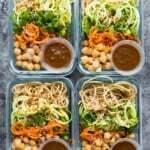 These cold sesame noodle meal prep bowls are the perfect vegan prep ahead lunch: spiralized vegetables tossed with chickpeas and whole wheat spaghetti in a spicy almond butter sauce. After almost a year of losing my spiralizer during our move, I finally found it! Happy dance! I was SO excited to unpack it and get back to spiralizing. I love spiralizing to add new textures to salads, and trick myself into lightening up some traditionally carb-laden recipes. 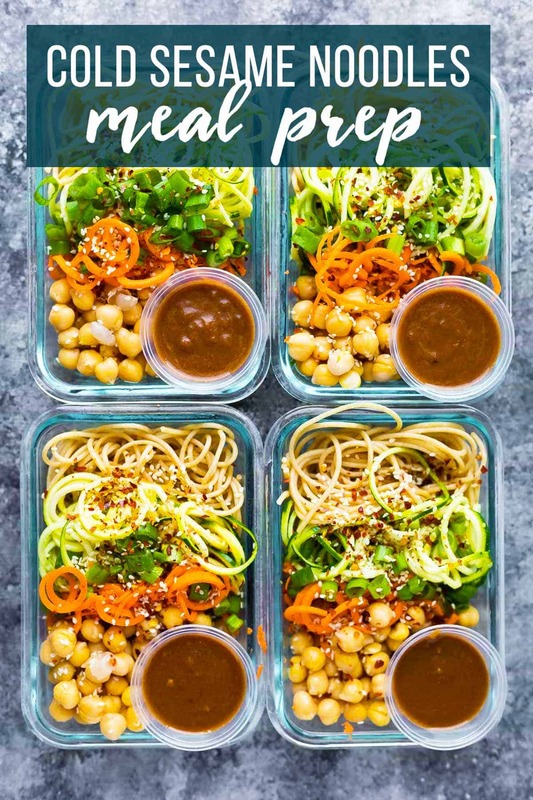 Now I’m not saying these cold sesame noodle meal prep bowls are low carb…however they are much lower carb then they would be with straight up pasta. And please, no one tell him, but Kai happily munched on a zucchini noodle thinking it was pasta. He was totally tricked! Muah ha ha. they are vegan. 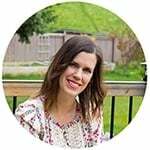 I’m hoping to add more plant-based meal prep recipes in 2018 for you guys! THE SAUCE. Spicy, creamy, tangy, gingery…gah. Enough said. You are eating a ton of veggies but it really doesn’t feel like it! I cut the standard 2 oz pasta serving in half and swapped with spiralized zucchini and carrots. It is still a filling and satisfying meal. no microwave needed. Open, toss in sauce, eat. The end. 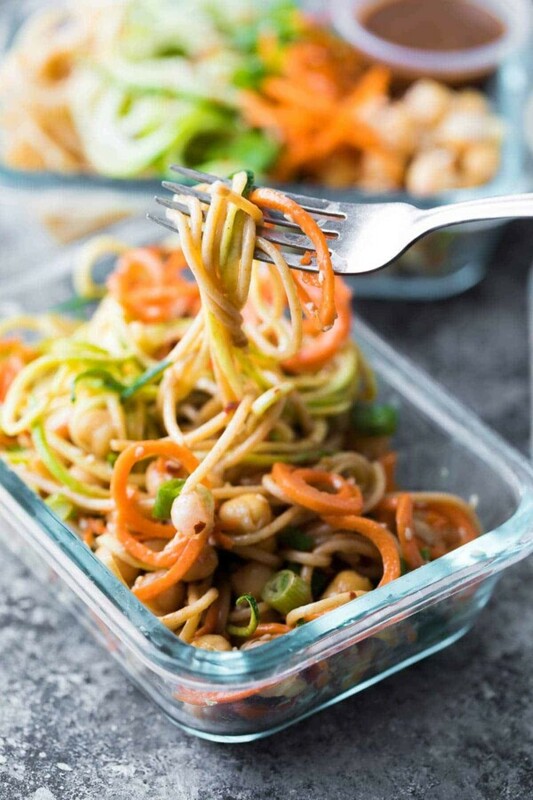 Now there are a few different components to these cold sesame noodles: whole wheat pasta, spiralized veggies, and sauce. 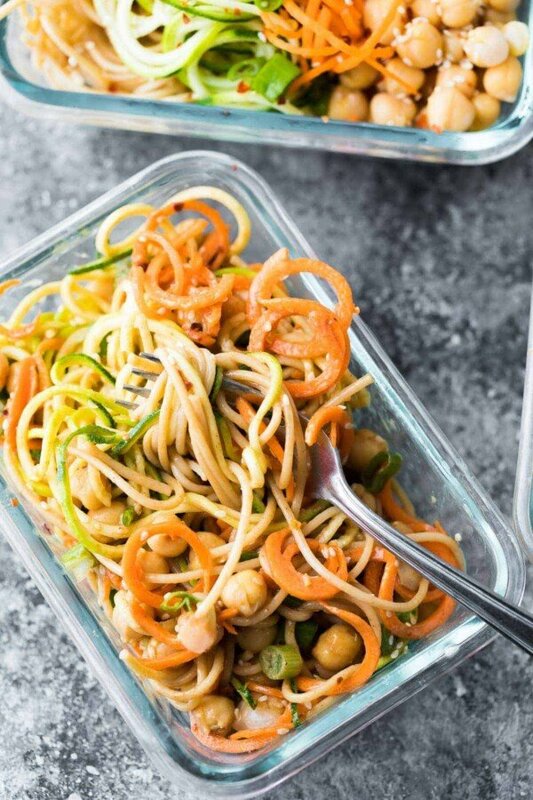 All round, it should still take you under 30 minutes to prep, since you can work on the almond butter sauce and spiralizing the veggies while the pasta cooks. For protein, we kept it simple with canned chickpeas. You could swap for edamame or even chicken if you’d like. Looking for more noodley recipes? Try this Healthy Greek Chicken Pasta Salad Recipe! 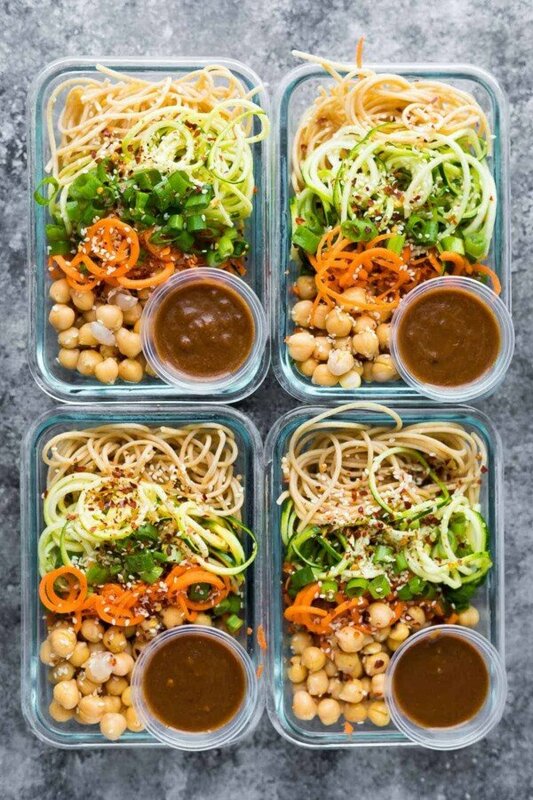 Watch the video below to see exactly how I prepped my Cold Sesame Noodle Meal Prep Bowls. It’s so easy! You can find more of my recipe videos on my YouTube channel, or on Facebook. Cook pasta according to package directions. Rinse under cold water and set aside to cool completely. Portion out pasta, zoodles, carrot noodles and chickpeas between four 2-cup storage containers. Sprinkle with green onions and sesame seeds. 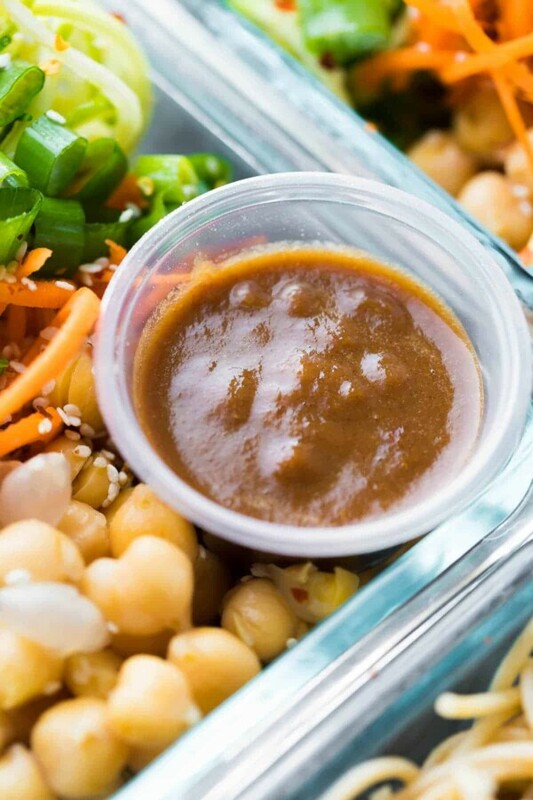 Stir or shake together all almond butter sauce ingredients, and divide amongst 2 oz storage containers. Store in the fridge for up to 4 days. This recipe is not freezer-friendly. Enjoy cold. Drizzle with the almond butter sauce and toss up before serving. Almond butter may be swapped with any other natural nut butter. Absolutely amazing! The satay sauce is so tasty and aromatic and everything works so well together. I make this meal regularly and it is thoroughly enjoyed. So happy you enjoyed, Kirsty! Thanks so much for taking the time to leave a review. sauce makes everything bearable, if you don’t like to eat healthy lol. i do like to eat healthy so the whole thing was great…may roast chickpeas next time but honestly was super surprised at how much flavor the sauce packs, just enough for everything. Great Recipe! I love that it is vegan friendly as well howecer my son needs some meat here as he does lots of physical activities. So if you meal prep this with chicken, can you still keep it in the fridge for up to 4 days? Hi Jinny! Yes, cooked chicken is safe for up to 4 days in the fridge. Bet that would be great in this recipe! My handheld spiralizer is not the best for carrots because they tend to be thin so I’ll have to try it with a tabletop/crank version! They still came out fabulous loved everything. I roasted the chickpeas instead of leaving them raw to add some crispyness with a little cayenne pepper and threw in some avocado chunks that went great with the sauce. Perfect to meal prep and have lunch/dinner ready fast! So happy you enjoyed! Thanks for leaving a review, Niki! Hi Blayne! I think that would work! I wouldn’t do it the night before though. Hope you enjoy! Do you freeze this one ? Unfortunately the pasta and zucchini noodles do not freeze/thaw well. Do you have lower calorie substitute for dressing? Is the nutritional information for the entire recipe worth of ingredients (4oz noodles)? Or is it for one serving with one ounce of noodles? It’s the entire ingredients list divided by four, so 1 oz (uncooked) pasta per serving. Not sure how much that equals in cooked pasta. Oh interesting with the essential oils! I just got a diffuser and LOVE them. Thanks Belyn! Can I substitute peanut butter for almond butter? Yes! Make sure you use a natural peanut butter. Hope you enjoy! Can you freeze this for a meal later? what brand spiralizer do you use in the video? i need one of thisr. I will ask my video girl which one she used. I have the Paderno Tri-Blade and love it! I’m not vegan, but this recipe is FANTASTIC. I followed the recipe exactly, using real almond butter, real maple syrup. Delicious. I’ve already made it twice and have shared the recipe. I wish I could post a picture! Thanks for a great recipe. I’m so happy to hear this! Thanks for your review, Cristi! i just made the sauce and it was real runny. I didn’t see anyone else question the amount of vinegar but I just want to make sure it is TABLESPOONS not TEASPOONS. Maybe my almond butter was old. I’m going to give it another try but can you confirm the ratios are written correctly before I put it together a second time? THANK YOU FOR CHECKING! Hi Katie, yes it is tablespoons 🙂 It should be liquidy enough to use as a dressing, but still slightly thickened…watch the video in the post for a good visual. Perhaps your almond butter was on the liquidy side? Let me know how it turns out if you try again! I found the sauce too salty so cut the soy sauce in half and it was delicious! I made rice paper rolls with bean sprouts, cucumber, red pepper, Thai basil, mint and mango. The sauce was perfect for them!!! Hi Jane! Did you use reduced sodium soy sauce? I find regular soy sauce way too salty and exclusively use the reduced sodium stuff these days. I mentioned it in the recipe card. Glad you enjoyed! Hi Heather! I would swap the zucchini noodles for shredded cabbage, broccoli slaw, or any other hardy vegetable mix. I think this dressing would work great with a number of veggies! Happy to hear you enjoyed it, Bethany! Hi, I’m trying not to use oil. Can you recommend something in its place for the dressing? Hi Rosemary! Apologies for my late reply; I’ve just returned from holidays. I would just leave the sesame oil out, although there are natural oils in the almond butter as well. I’m not sure what you could swap the almond butter for. Hope you enjoy! Isn’t that a lot of carbs and sugar? Hi Rhiannon, apologies for my late reply, I’ve just returned from holidays! These are the Snapware 2 cup storage containers. They can be challenging to find on Amazon sometimes but they are in stock on the Snapware website! So delicious!! I subsituted chicken for chickpeas and peanut butter for the almond butter. So yummy! And awesome dish for summer when you don’t want something hot. Great recipe! Those are cute! Thanks for sharing! I love this so much! The first time I made it I followed the recipe exactly and it was so good that my fiancé and I both couldnt help but to eat it for both lunch and supper on that very day. The second time I made it I decided to play around a little and subbed out the almond butter for tahini to give it even more of a sesame kick, and used a tsp of ground fresh chili paste instead of the half tsp of flakes, to pump up the heat, and it was sooooo lovely. Tonight, I really just wanted a side salad to go with my meal, so I only made the spiralized zucchini and carrot, topped with the green onions. For the dressing I did the tahini and chili paste thing again, however this time I integrated the ingredients together using my immersion blender. And holy moly! It was so smooth and almost whipped in texture and it just made it seem so decadent. I’m addicted. If i wanted to just buy a dressing to put on this vs make it what would you suggest? Like a Thai peanut dressing? I think a Thai peanut dressing would be perfect! I love using silicone baking cups (round or otherwise shaped) for my sauce cups. They are so easy to clean and you can squeeze them to get all the sauce out. I can’t wait to try this recipe, it looks amazing! I am looking those up asap! I dislike plastic as well. Thanks, Kate! Oh yes! This is my new favourite lunch! Just made it for dinner and got so excited to eat it that I forgot the chickpeas! I added some avocado and it was so delicious. Thanks for sharing. This is now in my rotation ?? I will remember the chickpeas next time. Woo hoo! So happy you liked it! This was simple to make and tasted amazing!! I subbed GF pasta for the whole wheat and liquid aminos for the soy sauce to make this gluten free but otherwise followed the recipe exactly. I do like a bit more spice, so will probably either increase the pepper flakes or add a touch of sriracha next time I make this. I’m so happy you enjoyed them Megan! Thanks for reporting back. Oh my goodness… I want to eat this sauce on everything! Made this for meal prep for the first part of the week for my fiance & I (chickpeas in mine & chicken for him), and I am definitely adding it to the list of things to make again! Yay! So happy you enjoyed it, Katie! This is definitely dinner tonight! (And lunch tomorrow) You make the BEST vegan stuff! Thank you!